WASHINGTON—For months, President Barack Obama said there were limits to his power to protect people living illegally in the U.S. from deportation. Now, he is considering broad action to scale back deportations that could include work permits for millions of people, according to lawmakers and immigration advocates who have consulted with the White House. The shift in White House thinking came after House Republicans said they wouldn't take up immigration legislation, which Mr. Obama and advocates for immigrants had hoped would create a path to citizenship for many in the U.S. illegally. Mr. Obama already has offered work permits and safe harbor from deportation to so-called Dreamers—about 500,000 people brought to the U.S. illegally as children. The new action could expand those protections to their parents or to other sets of illegal immigrants. Such a move would please many Hispanic Americans and immigrant-rights advocates, who have pressed Mr. Obama to use executive authority to protect illegal immigrants with roots in the U.S. But it certainly would anger Republicans, who say Mr. Obama already has overstepped his authority by expanding protections from deportation. "Such unlawful and unconstitutional action, if taken, cannot stand," Sen. Jeff Sessions (R., Ala.) said on the Senate floor this week. An announcement is expected soon after Labor Day, an administration official said. The White House said Tuesday that no decisions on new deportation policy had been made. The matter is being debated as the administration also responds to a surge in Central American children crossing the U.S. border. In that case, Mr. Obama has taken a tough stance, saying that everyone who doesn't meet narrow legal criteria to stay will be deported. The border crisis doesn't appear to be dissuading Mr. Obama from considering policy changes to offer a measure of safe harbor for at least some of the 11 million people already settled illegally in the U.S. After legislation died in Congress that would grant many of them a route to citizenship, he said he would "fix as much of our immigration system as I can on my own, without Congress." Last month, Mr. Obama told members of the Congressional Hispanic Caucus he was prepared to take significant executive action, said Rep. Luis Gutierrez (D., Ill.). The lawmaker said Mr. Obama suggested he would offer safe harbor from deportation to certain illegal immigrants with roots in their communities and family ties to U.S. citizens. One option under consideration would expand the program that offers work permits and protection from deportation to many young people who were brought to the U.S. illegally as children, known as Deferred Action for Childhood Arrivals. In a series of meetings with immigration advocates, faith leaders and experts, senior White House officials have asked how the administration might structure an expansion of that program, such as who might be included, participants said. The meetings have been run by White House Counsel Neil Eggleston and Cecilia Munoz, who heads the White House Domestic Policy Council. One possibility under discussion is to protect people with children who are U.S. citizens, participants said. That group numbers about 4.4 million, according to the research group National Foundation for American Policy. Another option is to include parents of existing participants in the deferred-action program, a group estimated to range from 550,000 to 1.1 million. Other options include defining the group based on length of U.S. residence or employment status. Participants said administration officials have also asked about an alternative approach to protecting people called "parole in place," which has a different legal foundation but also could allow the government to issue work permits to illegal immigrants. "It was clear the administration is really, finally looking at providing a temporary solution to the 11 million that are here," said one participant, Marielena Hincapie, executive director of the National Immigration Law Center. Laura Murphy, who heads the ACLU's Washington legislative office, said she came out of her meeting sure that the administration is considering significant action to help undocumented residents. The White House is currently debating the limits of its legal authority, knowing its actions could be challenged in court by opponents. In the spring, Mr. Obama announced an administrative review of deportation policy, and for months, administration officials signaled the results would be modest, partly to keep the pressure on Congress to enact a permanent fix. The ideas discussed then are still under consideration, officials said. Those included making it clear that people with immigration violations but not criminal records aren't priorities for deportation, and changes to the controversial Secure Communities program, which uses local law-enforcement agencies to identify and hold people in the U.S. illegally. In the past, Mr. Obama suggested he didn't have the power to do more. At an event last fall, a heckler yelled that he had the power to stop deportations. He replied, "Actually, I don't. If, in fact, I could solve all these problems without passing laws in Congress, then I would do so. But we're also a nation of laws." The change in heart also comes after significant pressure from immigration activists, who have branded Mr. Obama the "deporter in chief" for record deportations under his administration. That continues on Thursday, when faith leaders will protest outside the White House, and then on Saturday, with a march from the National Mall to the White House sponsored by the #Not1More campaign. Marisa Franco, who is helping to organize the march for the National Day Laborer Organizing Network, said her group was pushing for safe harbor for an even larger group—some 8 million people who would be eligible for legal status under legislation passed by the Senate. "The only question left is the scope of the change the president will make and whether it will be the fullest of what people deserve," she said. Activists pressured Mr. Obama in 2012 to offer safe harbor to young people brought to the U.S. illegally as children. The White House at first said it had no power to do so, and then changed its mind. One person familiar with the internal discussions said shifts like this come about because policy makers are initially told by White House lawyers that a particular executive action is "challenging and hard." That was the case with the deferred-action program for some children. When policy aides later pushed and ask for a full vetting by the lawyers, the lawyers then concluded the action was "aggressive" but permissible under the law, this person said. GAZIANTEP, Turkey — A U.S.-backed effort to arm the moderate Syrian opposition is finally ramping up along the Turkey-Syria border, but it may come too late to save the rebels from defeats on two fronts, by President Bashar al-Assad’s government and by the extremists seeking to carve out an Islamic state. Spurred by concerns that the al-Qaeda-inspired radicals will continue their relentless march across Iraq and Syria, the United States and its allies have begun accelerating the supply of arms and ammunition to a small number of vetted rebel groups in northern Syria, according to diplomats and rebels who have been receiving the deliveries. Yet even as the fresh support arrives, challenges are mounting for the embattled moderates, who have been pushed out of eastern Syria by extremists, are being encircled in Aleppo by the government and are seeing their ranks eroded by defeats, desertions and infighting. The outlook for the revolt against Assad’s rule is now bleaker than at any time in the past three years, rebel commanders say, diminishing the chances that the opposition will be able to present any meaningful challenge to the regime or even to serve as a counterweight to Islamist radicals, as U.S. policymakers are hoping. On Sept. 7, 2000, in the waning days of the Clinton administration, a U.S. Predator drone flew over Afghanistan for the first time. The unmanned, unarmed plane buzzed over Tarnak Farms, a major al Qaeda camp. When U.S. analysts later pored over video footage from this maiden voyage, they were struck by the image of a commandingly tall man clad in white robes. CIA analysts later concluded that he was Osama bin Laden. From that first mission, the drone program has grown into perhaps the most prominent instrument of U.S. counterterrorism policy—and, for many in the Muslim world, a synonym for American callousness and arrogance. The U.S. has used drones to support ground troops in Iraq and Afghanistan and, particularly under President Barack Obama, to hammer the high command of al Qaeda. A recent study by the Stimson Center, a think tank in Washington, D.C., estimates that U.S. drone strikes in Pakistan have killed 2,000 to 4,000 people. Other countries are trying to get into the act, including Iran, which U.S. officials say has flown drones over Iraq during the current crisis there. Drones seem to be everywhere these days, buzzing into civilian life and even pop culture. French players complained before the World Cup that a mysterious drone-borne camera had spied on their training sessions. Amazon owner Jeff Bezos hopes to use drones for faster home delivery. Tom Cruise starred last summer as a futuristic drone repairman in the sci-fi thriller "Oblivion," and Captain America himself faced down lethal super-drones in this spring's "The Winter Soldier." Hollywood is even using drones in real life, helping to film such tricky scenes as the chase early in the 2012 James Bond caper "Skyfall," when Daniel Craig as 007 races across the rooftops of Istanbul. But as ubiquitous as Predators, Reapers, Global Hawks and their ilk may now seem, the U.S. actually stumbled into the drone era. Washington got into the business of using drones for counterterrorism well before 9/11—not out of any steely strategic design or master plan but out of bureaucratic frustration, bickering and a series of only half-intentional decisions. The birth of the armed-drone program underscores two central ironies. First, the weapon that the U.S. deployed so eagerly after 9/11 was a hot potato that it juggled around internally beforehand. (Indeed, the George W. Bush administration devoted most of its lone pre-9/11 cabinet-level meeting on al Qaeda—convened on Sept. 4, 2001—to wrangling about the drone program.) Second, for a program now so widely criticized in the Muslim world for killing civilians, pre-9/11 policy makers were actually driven toward armed drones because the more traditional alternatives involved unacceptable risks of collateral damage. The U.S. wound up using drones only after trying many other ways to take the fight to al Qaeda, which was proving increasingly lethal—particularly after Aug. 7, 1998, when its suicide bombers destroyed the U.S. embassies in Kenya and Tanzania. Bin Laden survived U.S. reprisal airstrikes on Afghanistan, and the Clinton administration began a frustrating search for other options—ranging from working with unreliable proxy forces to try to capture bin Laden to a cumbersome proposal to kill him with Tomahawk cruise missiles fired from submarines in the Arabian Sea. But many senior officials never felt they had truly "actionable intelligence" for such strikes, the risk of killing nearby civilians loomed large, and the lag time between learning of bin Laden's whereabouts and the missiles' impact would have given him hours to move. In March 2000, after Mr. Clinton complained that the U.S. could surely do better against bin Laden, counterterrorism officials renewed their brainstorming. One key problem: The intelligence community wasn't coming up with information about bin Laden's whereabouts reliable enough to green-light airstrikes. Pentagon officials suggested flying unarmed Predator drones over al Qaeda camps. Richard Clarke, the White House counterterrorism chief, liked the idea and dubbed it "Afghan Eyes." The Predator is a snub-nosed, light, unmanned plane with a wingspan of about 55 feet, made by General Atomics Aeronautical Systems. More primitive Predators were first flown in 1994, when the Pentagon hoped that they would provide aerial video and reconnaissance to help dominate 21st-century battlefields. But they were built as surveillance platforms, not as remote-control bombers. After the first Predator buzzed Afghanistan in 2000, Mr. Clarke called the footage "truly astonishing." After another drone flight on Sept. 28 spotted the "man in white," the intelligence community concluded that he was probably bin Laden. Counterterrorism officials grew more eager for drone missions after al Qaeda operatives in Yemen rammed the USS Cole on Oct. 12 of that year, leaving 17 U.S. sailors dead. Mr. Clarke's staff prepared a strategy paper calling for more Predator flights starting in March 2001, after the worst of the Afghan winter. But it was only after 9/11 that the new Bush administration flew drones over Afghanistan. Mr. Clarke, who had been kept on at the National Security Council, grew even more excited after he learned that the Air Force might be able to rig up Predators with Hellfire missiles—allowing the U.S. to spot and shoot bin Laden from the same platform. But Cofer Black, the head of the CIA's counterterrorism center, wanted to wait until armed drones were ready, writing that "the possible recon value" paled beside the risk of "the Taliban parading a charred Predator in front of CNN." The new national security adviser, Condoleezza Rice, backed the CIA and held off on reconnaissance flights. As intelligence flooded in during the summer of 2001 about potentially "spectacular" al Qaeda attacks, the CIA and the Pentagon bickered about the costs and control of the drone program. Meanwhile, George Tenet, the CIA director, was "appalled" by the idea of CIA leaders deciding whether to take a shot with an armed drone. During the Bush administration's first cabinet-level meeting on al Qaeda, the still-grounded drones dominated the discussion. Dr. Rice suggested holding off until the spring and then flying armed Predators. Treasury Secretary Paul O'Neill was "skittish" about trying to kill an individual with a drone. Senior officials grappled with who would pull the trigger: Mr. Tenet or Defense Secretary Donald Rumsfeld? Having foregone months of reconnaissance flights, the administration now concluded that they were a "good idea," and Mr. Tenet told the CIA to prepare for them. They were still preparing a week later, on Sept. 11. In November 2001, a Predator drone killed al Qaeda's military commander, Muhammad Atef —the "first known killing by armed drones," according to the Council on Foreign Relations. A counterterrorism instrument that had confounded policy makers before 9/11 began to turn into a favored weapon in the U.S. arsenal. Drones have since become a formidable symbol of American power—in ways that those present at the creation could scarcely have imagined. BAGHDAD—A campaign by Sunni insurgents to establish an Islamic caliphate across Iraq and Syria and expel other Muslim sects and religions is taking a sharp toll on the countries' cultural heritage. The latest casualty was a shrine in the northern Iraqi city of Mosul said to contain the tomb of Jonah, who is revered as a prophet by Jews, Christians and Muslims—who call him Younes. The Nabi Younes Mosque, a towering structure that housed the shrine, was also destroyed in Thursday's blast. "They turned it to sand, along with all other tombs and shrines," said Omar Ibrahim, a dentist in Mosul. "But Prophet Younes is something different. It was a symbol of Mosul," said Mr. Ibrahim, a Sunni. "We cried for it with our blood." Though its population is predominantly Sunni, Mosul was a symbol of religious intermingling and tolerance in Iraq. Nineveh, the wider province, is a Assyrian Christian center dating back thousands of years. That Jonah's shrine was in a mosque was a proud reflection of that coexistence. The site was a monastery centuries ago before it was turned into a mosque, said Emil Nona, the Chaldean Catholic archbishop of Mosul. "Nabi Younes was famous in the city of Mosul, the most famous mosque in the area," Archbishop Nona said. "I'm very sorry to see this place destroyed." Islamic State and other groups following ultraconservative Sunni ideology believe the veneration of shrines or tombs is unholy. Many also denounce the veneration of any prophet besides Muhammad, believed by Muslims to be God's messenger. 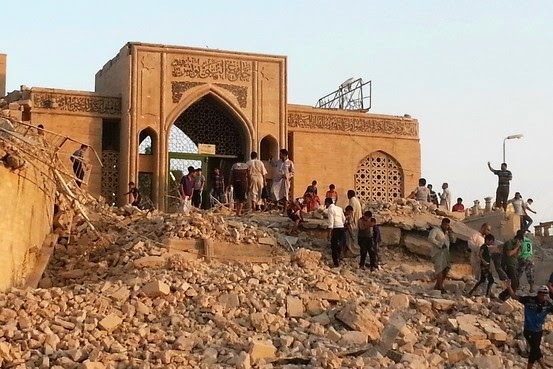 In Mosul, they have already destroyed at least two dozen shrines, as well as Shiite places of worship, and raided the Mosul Museum, officials said. "This most recent outrage is yet another demonstration of the terrorist group's intention to shatter Iraq's shared heritage and identity," said Nickolay Mladenov, the United Nations secretary-general's special representative for Iraq, on Friday. Iraqi officials at the tourism ministry and religious officials in Mosul confirmed the shrine as destroyed in a militant attack on Thursday. The attack is captured in amateur video footage shot by locals and posted online. In one, a thick plume of brown smoke rises in the air, presumably over the mosque as it collapsed, as the narrator says: "No, no, no. There goes the Prophet Younes." The shrine held particular significance for Iraqis because Jonah—who in stories in both the Bible and Quran is swallowed by a whale—"was a prophet for all," said Fawziya al-Maliky, director of heritage at the tourism ministry. "We don't know what these backward militants are thinking, what kind of Islam they are pursuing," she said. "They are pursuing the end of civilization." The attack was another blow to the country's Christian community. The Islamic State has been pursuing a deliberate anti-Christian campaign in Iraq. Thousands of Christians fled Mosul last week after Islamic State posed an ultimatum: convert to Islam, pay a tax, flee or face death. Christian residents said they were terrorized and humiliated in their own city as militants singled out their homes. Candida Moss, a professor at the University of Notre Dame, called it "part of the irreversible eradication of Christian history and culture in Iraq." See also this 7-31-2014 article in The New York Times. PHOENIX — Before they sloshed and skidded across the Rio Grande, Greysi and Claudia Paula had never been on a plane. LOS ANGELES — The vast majority of unaccompanied migrant children arriving in the United States from Central America this year have been released to relatives in states with large established Central American populations, according to federal data released Thursday night. A total of 30,340 children have been released to sponsors — primarily parents and other relatives — from the start of the year through July 7, according to the Office of Refugee Resettlement, which has overseen the care of the children after they are turned over by Customs and Border Protection. More children have been released in Texas than in any other state, with sponsors there receiving 4,280 children, followed by New York with 3,347. Florida has received 3,181 children and California 3,150. Maryland and Virginia have each also received more than 2,200 children. The numbers do not include those children who are still being cared for in shelters, which have prompted the most outrage from governors and other local officials across the country. Many children who are placed in shelters for some period of time — anywhere between a few days and a few months — have later been released to family members. Officials have said that more than half of all children initially placed in shelters have gone on to be reunited with at least one parent already living in the United States, and 85 percent of all children have been placed with a close family member. A wave of newly insured patients helped boost hospitals' earnings in recent months, two hospital operators said Friday, a sign the law's coverage expansion is leading more patients to seek treatment. Under the law, up to 26 million people are expected to gain coverage over the next few years through expanded state-run Medicaid programs and through the new, online marketplaces that allow consumers to get subsidies to buy coverage. Many who were previously uninsured already received hospital care, but sometimes racked up bills that were never paid. The hospital industry supported the 2010 law—which was expected to cost hospitals $155 billion in penalties and government pay cuts over a decade—on the promise that it would deliver a wave of new, paying patients. But hitches as the law rolled out, including a Supreme Court decision that allowed states to opt out of the Medicaid expansion and a troubled launch of the marketplace websites, threw doubt on whether those gains would materialize. The War That Broke a Century - A king, a kaiser, a czar—all were undone as they realized what they had unleashed with World War I. Reading World War I histories, I have been startled to realize the extent to which the leaders or putative leaders of the belligerent nations personally suffered. A number of them fell apart, staggering under the pressure, as if at some point in the day-to-day they realized the true size and implications of the endeavor in which they were immersed. They seemed to come to understand, after the early hurrahs, that they were involved in the central catastrophe of the 20th century, and it was too big, too consequential, too history-making to be borne. Some would spend the years after the war insisting, sometimes at odd moments, that it wasn't their fault. As Miranda Carter shows in " George, Nicholas and Wilhelm " (2010), the king of England, the czar of Russia and the kaiser of Germany—all cousins, all grandchildren of Victoria—were all in different ways wrecked by the war. Kaiser Wilhelm, whose bombast, peculiarities of personality and lack of wisdom did so much to bring the conflict, folded almost from the start. Two years in, he was described by those around him as a "broken man"—depressed, lethargic, ill. An aide wrote of him as "violent and unpredictable." Barbara Tuchman, in the classic "The Guns of August" (1962), notes how in the early days of the war Wilhelm's margin notes on telegrams became "more agitated." ("Rot!" "He lies!" "False dog!") In time, top brass shunted him aside and viewed him as irrelevant. The kaiser rarely referred to the sufferings of his people. Ms. Carter writes: "Wilhelm had always had difficulty in empathizing with others' difficulties." When his country collapsed, he fled to Holland, where in conversation he referred to his countrymen as "pigs" and insisted that the war was the fault of others. He died at age 81 in 1941, two years into World War II. King George V did have empathy, and it almost killed him. Touring the Western Front, he suffered at the sights—once-rich fields now charred craters, villages blasted away, piles of dead bodies. He aged overnight, his beard turning almost white. Ms. Carter writes that he now surveyed the world with a "dogged, melancholic, unsmiling stare." A year into the war, a horse he was riding on a visit to the front got frightened, reared, and fell on him. The king never fully recovered from the injuries. Years later, he was haunted by what he called "that horrible and unnecessary war." In 1935, war clouds gathering once again, he met up with his wartime prime minister. The king, wrote Lloyd George, "broke out vehemently, 'And I will not have another war, I will not.' " He also said that the Great War had not been his fault. He died the following year. Czar Nicholas II of Russia, of course, would lose everything—his throne and his life, as his family would lose theirs. But from the early days of the war he too was buckling. His former chief minister, Vladimir Kokovtsov, called Nicholas's faded eyes "lifeless." In the middle of conversations, the czar lost the thread, and a simple question would reduce him to "a perfectly incomprehensible state of helplessness." Two years in, Kokovtsov thought Nicholas on the verge of nervous breakdown. So did the French ambassador, who wrote in the summer of 1916: "Despondency, apathy and resignation can be seen in his actions, appearance, attitudes and all the manifestations of the inner man." The czar wore a constant, vacant smile, but glanced about nervously. Friendly warnings that the war was not being won and revolution could follow were ignored. For him, in Ms. Carter's words, "Contradiction now constituted betrayal." At the end, those close to Nicholas wondered if he failed to move to save his throne because he preferred a crisis that might force his abdication—and the lifting of burdens he now crushingly understood he could not sustain. Then there is Woodrow Wilson at his second Versailles peace conference, in the spring of 1919. Negotiations were draining, occasionally volatile. The victors postured, schemed and turned on each other for gain. They had literally argued about whether windows should be opened, and about what language should be the official one of the talks. (They settled on three.) President Wilson developed insomnia and a twitch on the left side of his face. He was constantly tired, occasionally paranoid. After a trying meeting with France's finance minister, Louis Klotz, Wilson joked with a friend of his weariness: "I have Klotz on the brain." On the afternoon of May 1 at the peace conference, Wilson suddenly announced in his office, to his wife and his doctor, Adm. Cary Grayson, "I don't like the way the colors of this furniture fight each other." As biographer A. Scott Berg notes in "Wilson," published last year, the president continued, saying: "The greens and the reds are all mixed up here and there is no harmony. Here is a big purpose, high-backed covered chair, which is like the Purple Cow, strayed off to itself, and it is placed where the light shines on it too brightly. If you will give me a lift, we will move this next to the wall where the light from the window will give it a subdued effect. And here are two chairs, one green and the other red. This will never do. Let's put the greens all together and the reds together." Mr. Berg : "Wilson's bizarre comments did not end there. He described the Council of Four meetings, how each delegation walked like schoolchildren each day to its respective corners. Now, with the furniture regrouped, he said each country would sit according to color"—the reds in the American corner, the greens in the British. Grayson didn't know what to think. Perhaps it was nervous exhaustion, perhaps a sign of something more serious. After returning to the U.S., Wilson launched a grueling campaign for America to join the League of Nations. That fall, in the White House, he would suffer the stroke or strokes that would leave him disabled the rest of his life. President Barack Obama said Friday the U.S. is considering a limited refugee program in Central America, for the first time allowing young people to apply for entry without first making the dangerous trek north. With Congress deadlocked on a broader White House request for border funding, the refugee plan is one step the administration says it can take on its own to try to stem a surge in unaccompanied Central American minors illegally entering the U.S. from Mexico. White House officials said the program would be based in Honduras, a nation gripped by gang violence and the source of the largest number of unaccompanied Central American minors apprehended on the U.S. border this fiscal year. ATLANTA — There are new concerns from Gov. Nathan Deal about who is going to pay for the influx of immigrant children that are ending up in the state of Georgia. He sent a letter to President Barack Obama Thursday demanding answers. [A]bout 1,100 immigrant children now living in the Georgia. In the letter, Deal said he was surprised to learn about the influx of immigrants. “We were surprised as anyone this week, to discover how many unaccompanied minors were sent to Georgia just in the last six months,” he wrote. Deal also asked how much they will cost taxpayers and said that he was concerned about what may e a surge in school district enrollment. Schumer offers flawed solution to gridlock - Of California's two reforms, it was the nonpartisan redistricting, not the jungle primary, that returned the state to governability. Would the dysfunction of U.S. politics be dispelled if we got rid of partisan primaries? That’s the contention of Sen. Charles Schumer (D-N.Y.). In an op-ed for the New York Times, Schumer argued that the primary system in most states, in which voters choose nominees for their respective parties who then run head to head in November, gives too much weight to the party faithful, who are inclined to select candidates who veer either far right or far left. The cure Schumer proposes for this ill is the “jungle primary,” in which all primary candidates, regardless of party, appear on the same ballot, with the top two finishers, again regardless of party, advancing to the general election. The senator cites the example of California — once the most gridlocked of states, now a place where legislation actually gets enacted — as proof that such primaries work. But Schumer misunderstands what got California working again. In so doing, he also misses the fatal flaws of the jungle primary. Before 2010, California government was inarguably paralyzed. State law required a two-thirds vote in each house of the legislature to pass a budget and raise taxes. Divided after the 2008 financial crash between Democrats who wanted to avoid draconian cutbacks and Republicans opposed to tax increases, budgets went unpassed. Support for colleges, health care and infrastructure plummeted, and the state was briefly compelled to pay its employees and contractors with IOUs. In 2010, however, voters enacted a series of ballot initiatives that brought an end to Sacramento’s stagnation. They repealed the requirement that budgets needed a two-thirds vote for passage; no budget deliberations have exceeded the legal deadline since. They took redistricting for both congressional and legislative seats out of the hands of the legislature and handed it to a nonpartisan commission. And they enacted the jungle primary. Of the two latter reforms, it was the nonpartisan redistricting, not the jungle primary, that returned the state to governability. The new districts, which were put in place in time for the 2012 election, no longer were carved to protect incumbents of either party. The effect of these changes, beyond eliminating some incumbents of both parties, was to create districts in which the rising number of Latino and Asian voters across the state gave the Democrats an edge — so much so that the party won a two-thirds majority in both legislative houses, enabling state government to raise revenue again. And what has the jungle primary accomplished? Its adherents had hoped that, in heavily conservative districts where the top two primary finishers were both Republicans, the more centrist of the two would win the November runoff by corralling more Democratic and independent votes. So far, however, that hasn’t happened. Democrats representing more centrist districts, generally in inland California, do tend to be less liberal, but that was the case long before the jungle primary came into effect. The jungle primary has had one stunningly perverse effect, however. In a new congressional district east of Los Angeles, Democratic voters had a clear majority — so clear that four Democratic candidates and two Republicans sought the seat in the 2012 primary. Democratic votes split four ways, enabling the two Republicans to advance to November’s ballot. The eventual winner, Gary Miller, chose not to run for reelection this year — understandably, since his record in no way reflected the desires of most district voters. A weird one-off result? This June, three Democrats and two Republicans sought the statewide office of controller. More Democrats than Republicans tend to file for statewide office in California, and for good reason: The GOP is in free-fall in the state; its share of registered voters has dropped beneath 30 percent; just one Republican (Arnold Schwarzenegger) has been elected to any of California’s 10 statewide offices in the past 20 years. But since Democrats split their votes three ways for the controller’s slot and Republicans just two, a shift of less than 2 percent of the vote would have saddled voters with a Republican-vs.-Republican runoff. Fast-forward to 2018, when Democrat Jerry Brown, almost certain to be reelected this November, will be term-limited out of the governor’s office. More Democrats than Republicans will surely line up to succeed him. But under the jungle rules, even though it’s all but certain that the Democratic candidates will collectively aggregate more support, it’s a distinct possibility that two Republicans will face off in November. This is your solution, senator? Think again. GAZA CITY — When war between Israel and Hamas broke out two weeks ago, the Palestinian militant group was so hamstrung, politically, economically and diplomatically, that its leaders appeared to feel they had nothing to lose. Hamas took what some here call “option zero,” gambling that it could shift the balance with its trump cards: its arms and militants. Now, this conflict has demonstrated that while Hamas governed over 1.7 million people mired in poverty, its leaders were pouring resources into its military and expanding its ability to fight Israel. If it can turn that improved military prowess into concessions, like opening the border with Egypt, that may boost its standing among the people of Gaza — although at an extraordinarily high cost in deaths and destruction. Hamas had been struggling. The turmoil in the region meant it lost one of its main sponsors, President Bashar al-Assad of Syria, whom it broke with over his brutal fight against a Sunni Muslim-led insurgency, and weakened its alliance with Iran. It lost support in Egypt when the Islamist president, Mohamed Morsi, was ousted and replaced with a military-backed government hostile to Hamas. Unemployment in Gaza is around 50 percent, having risen steeply since Israel pulled out its troops and settlers in 2005 and severely tightened border restrictions. Hamas appeared powerless to end the near-blockade of its border by Israel and more recently Egypt. It could not even pay its 40,000 government workers their salaries. The group was so handicapped that it agreed to enter into a pact with its rival party, Fatah, to form a new government. But that seemed only to make matters worse, sowing division within its own ranks, with some in the military wing angry at the concession, while providing none of the economic relief Hamas had hoped for. When Hamas sent a barrage of rockets into Israel, simmering hostilities, and back and forth strikes, erupted into war. At first, when Hamas rockets were being intercepted mainly by Israel’s Iron Dome system as Israel hit Gaza with devastating force, the group strove to persuade its supporters that it was having enough impact on Israel to wrest concessions: Its radio stations blared fictional reports about Israeli casualties. But as it wore on, the conflict revealed that Hamas’s secret tunnel network leading into Israel was far more extensive, and sophisticated, than previously known. It also was able to inflict some pain on Israel, allowing Hamas to declare success even as it drew a devastating and crushing response. Its fighters were able to infiltrate Israel multiple times during an intensive Israeli ground invasion. Its militants have killed at least 27 Israeli soldiers and claim to have captured an Israeli soldier who was reported missing in battle, a potentially key bargaining chip. And on Tuesday its rockets struck a blow to Israel — psychological and economic — by forcing a halt in international flights. Hamas once again looks strong in the eyes of its supporters, and has shown an increasingly hostile region that it remains a force to be reckoned with. But Hamas’s gains could be short-lived if it does not deliver Gazans a better life. Israel says its severe restrictions on what can be brought into Gaza, such as construction materials, are needed because Hamas poses a serious security threat, and the discovery of the tunnels has served only to validate that concern. So far, at least 620 Palestinians have died, around 75 percent of them civilians, according to the United Nations, including more than 100 children. Gazans did not get a vote when Hamas chose to escalate conflict, nor did they when Hamas selected areas near their homes, schools and mosques to fire rockets from the densely populated strip. At the family house of four boys killed last week by an Israeli strike while playing on a beach, some wailing women cursed Hamas along with Israel. It is also unclear whether, when the fighting ends, Hamas will have the same kind of foreign support it has had in the past to rebuild its arsenal or its infrastructure; Egypt, under President Abdel Fattah el-Sisi, has destroyed hundreds of the tunnels that were used to bring in arms, money and supplies, and has kept the proper border crossing mostly closed. There are also some diplomatic efforts underway seeking to force Hamas to surrender its weapons in exchange for a cease-fire, a demand it is not likely to accept. Omar Shaban, an economist and political independent, sat in his walled garden in the southern Gaza town of Deir al-Balah as shells crackled nearby and said he fervently hoped, but also doubted, that both Hamas and Israel’s government would reach for a substantive deal. “This war will end tomorrow or after tomorrow, we will have another cease-fire, we will have another siege and Hamas will continue to run the scene,” he said. “Gaza is a big problem for everybody, for Hamas, for Fatah, for Israel,” he added, ticking off the list: shortages of water, housing and medicine, a population explosion, growing extremism. In exchange for a cease-fire, Hamas is demanding Israel and Egypt open their borders to end the restrictions on the movement of people and goods — the most immediate issue for ordinary Gazans. It is also asking for the release of prisoners — but avoiding the deeper political issues of the conflict. Bassem Naim, a member of Hamas’s political wing and a former health minister in Gaza, acknowledged that relations have soured with Iran and the Arab world, but said that it could survive. “I can’t deny the difficulty,” he said in a recent interview. “But Hamas was active and operating here inside the country before the Muslim Brotherhood was in the presidential palace” in Egypt. Hamas won Palestinian elections in 2006, but an international boycott prevented it from governing. It returned to power in Gaza in 2007 after ousting the Fatah-led government by force. Hamas overreached, Mr. Shaban said, more than doubling Gaza’s administrative budget to more than $800 million — not including the financing of the militant Izzedine al-Qassam brigades. But as the recent fight with Israel has revealed, Hamas was importing tons of cement — desperately needed for Gazan schools and houses and construction jobs — to reinforce the tunnels it built to infiltrate Israel and hide its weapons. Either Woods or Buck would take on Valarie Wilson in the general election this fall. Wilson, the former chairwoman of the City Schools of Decatur school board, defeated state Rep. Alisha Thomas Morgan, D-Austell, in the Democratic runoff Tuesday. Morgan, who has served in the House for a dozen years, was a favorite on the Democratic side from the moment she entered the race. But her support for a 2012 constitutional amendment that clarified the state’s authority to create charter schools angered many in her party. While that amendment was approved by voters, Democratic officials who had opposed it didn’t forget that Morgan had allied herself with conservative Republicans in that fight. Much of the party apparatus backed Wilson in the primary and the runoff. A Woods win over Buck could expose fissures in the GOP this fall. Woods opposes the controversial set of national academic standards known as Common Core. That stance holds him in good standing with tea party activists, who share his view of the standards as a federal intrusion into state control of public education. But business and military groups – not to mention top Republicans like Gov. Nathan Deal – support the standards. An effort in the General Assembly to essentially pull Georgia out of the Common Core was defeated this year – but not before a bitter fight that left many tea party activists angry with the GOP. Buck said the passionate opponents of Common Core contributed to Woods’ strong showing on Tuesday. Metro Atlanta’s Perdue support offset south Georgia’s Kingston backing. While Kingston held onto his big margins in south Georgia, Perdue more than wiped him out with big showings in populous metro Atlanta and other urban areas across the state. Perdue’s camp was ecstatic that Kingston’s net margin over Perdue in Savannah’s Chatham County was 12,000 – close to what they expected. If Kingston landed the same vote totals in coastal Georgia he tallied during the May primary, he’d be waking up to a different headline today. A slow windup and powerful close. Perdue’s camp went up with its infamous “Babies” TV ads early in the primary to define the race. But in the nine-week runoff – the longest in state history – they largely held their fire until the final weeks before the contest. Perdue’s aides said that helped them refuel and better target Kingston. As we’ve noted, Perdue and his allies were vastly outspent by Kingston in metro Atlanta, but spent far more than him elsewhere in the state. An effective grassroots network. Perdue advisers said it never got much media attention, but they built a formidable network of activists across the state who tapped an anti-incumbent streak to boost their candidate. That foundation is still intact, they say, and will come in handy against Nunn. The Chamber was both boon and burden. The closing days back-and-forth involved the U.S. Chamber’s heavy investment in the race on Kingston’s behalf, with a flood of positive ads (and a last-minute negative that few voters likely saw). Perdue used it as evidence that Kingston secretly supported “amnesty.” Talk radio host Erick Erickson tweeted that he had trouble convincing many friends to vote Kingston because of the Chamber’s backing. ATLANTA—Multimillionaire businessman David Perdue seized the Republican nomination for the U.S. Senate in Georgia on Tuesday night, and must now pivot toward the November general election that could help decide whether Democrats maintain control of the chamber. Mr. Perdue won the runoff with about 51% of the vote, with nearly all precincts reporting, with his biggest support in Atlanta's affluent northern suburbs. He edged out U.S. Rep. Jack Kingston, who ran strongest in his Savannah district and southeastern Georgia. Mr. Perdue, the 64-year-old former chief executive of Dollar General Corp., faces Michelle Nunn, 47, a daughter of former Sen. Sam Nunn who is running as a centrist Democrat. The GOP primary runoff lasted an unusually long and testy nine weeks, the result of a shift in federal election timetables in Georgia. Both Republicans had scored endorsements from well-known Georgians. Mr. Kingston had the backing of former House Speaker Newt Gingrich and Erick Erickson, who produces the influential Red State blog. 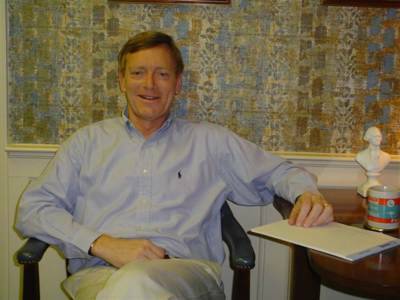 Mr. Perdue had help from his cousin, former Gov. Sonny Perdue, and former presidential hopeful Herman Cain. Mr. Perdue's supporters said they liked his experience in business and his relative inexperience in politics. "He can't solve [our problems] but he can be the beginning of the solution," said Brannon Lesesne, a 75-year-old investment counselor from suburban Atlanta. The victory of Mr. Perdue was a blow to the U.S. Chamber of Commerce, which spent at least $2.3 million on campaign ads backing his opponent. The business lobby liked that Mr. Kingston, an 11-term congressman, has pushed hard for federal funding to deepen the Savannah, Ga., harbor to expand capacity for trade. The prolonged fight has given Ms. Nunn the chance to raise money and use her advertising budget to talk about her experience running the Points of Light Foundation Inc., a charity promoting volunteerism that was founded by former Republican President George H.W. Bush. Ms. Nunn has raised about $9.3 million, according to her campaign. Outside groups also will spend millions on both sides. As of July 2, Mr. Perdue's campaign raised $5.8 million—$3.2 million from the candidate himself—and spent $5 million, according to the Center for Responsive Politics, a nonpartisan group that tracks election contributions. To understand what Vladimir Putin is really up to in Ukraine—why he is willing to take the kinds of risks that produced the destruction of a civilian airliner, and why the U.S. and its allies should see his power play as an effort to alter not just the arc of Ukraine but all of Europe—it's necessary to look at the tale of two countries. The first is Poland, a country of 38 million. After the end of the Cold War, this former Warsaw Pact nation turned westward. It almost immediately sought membership in the European Union and joined the North Atlantic Treaty Organization in 1999. After modernizing its economy, it officially became part of the EU in 2004. Next door to Poland lies Ukraine, a country of 44 million. After the end of the Cold War, this former Soviet satellite didn't turn west but rather stayed focused on its traditional relationship with Russia to the east. What has happened to these two neighbors in the quarter-century since the Berlin Wall fell? In a nutshell, they have moved in opposite directions. Poland, the country that integrated itself into the Western economy, has grown almost twice as fast as Ukraine. Last year, its growth rate was three times larger. Though it's the slightly smaller of the two neighbors, Poland now has a gross domestic product more than twice the size of Ukraine's. It has only half the share of its population living under the poverty line as does Ukraine. This is the contrast that must scare Mr. Putin. It also is the one that set off alarm bells when Ukraine, emulating neighboring Poland, began to pivot westward earlier this year. To allow that turn to happen, in the most important of Russian satellites, would have been the end of any near-term dreams of rebuilding a Russian empire. In short, the goal of re-creating a Russian sphere of influence was colliding head-on with the spread of a Westernized, EU model for Europe, which was seeping toward Russia's doorstep. Mr. Putin faced a historic choice: swim with the tide or try to turn it. He chose the latter. "I think [Russia's] goal is a weak and divided Ukraine, and a bigger goal is a weak and divided Europe—a weak and divided EU," says Robert Hormats, under secretary of state in the first Obama term. Moreover, to the extent a country such as Poland prospers, he adds, "it creates a very, very stark contrast to the troubled economic prospects in Russia" itself. Mr. Putin had to move quickly to reverse those trends, for he is at a moment of relative but passing strength. Today, Western Europe's dependence on Russian natural gas gives him some economic leverage. As Europe has gobbled up more of Mr. Putin's gas, EU trade with Russia has tripled in value over the last decade. This Russian economic advantage doesn't figure to last; eventually, Europe will wean itself away from its dependence on Russian carbon fuels. But for now, Mr. Putin must have calculated, he could make his play in Ukraine and face a muted Western response. And if that was his calculation, he was mostly correct. Business interests, not just in Europe but in the U.S., have resisted toughening economic sanctions. Perhaps the downing of an airliner has changed that; we'll learn more at a meeting of EU leaders Tuesday. This also explains why Poland looks with alarm at Russian bullying of Ukraine, and at the Western response so far. Poland knows from history that it is vulnerable to being yanked back toward the east, so it seeks more help from the Western club to which it now belongs. "The crisis in Ukraine could have been prevented," Polish Foreign Minister Radoslaw Sikorski said in an interview with German journalists published over the weekend. "Europe has done too little to influence Russia's behavior in the different stages of the conflict. When a Russian trade boycott against Ukraine was imposed last year to punish it for its European course, I pleaded with my colleagues to take action." If the West had moved then, he added, today's "escalation" probably would have been avoided. If Poland is indeed the success story, it's a particularly troubling note for President Barack Obama that a Polish magazine last month quoted Mr. Sikorski as saying, in a leaked tape of a private conversation, that Poland's defense ties to the U.S. were "worthless." In his weekend interview he was more diplomatic but still argued for more Western defense help to avoid Ukraine's fate. "The reality [is] that there are large [Western] military bases in countries that are safe. And there is a hesitation to build these bases in states that feel threatened."